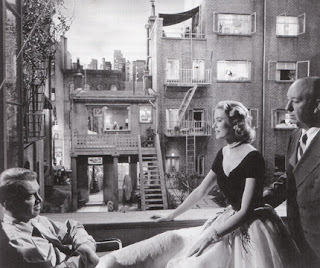 Rear window is considered by many to be one of Alfred Hitchcock’s greatest works. The master of suspense focuses on the pleasures of watching the mundane and everyday lives of others. He appeals to the dark and instinctive nature inherent in all of us; to know about the lives of others. However, he also twists around the concept of voyeurism to serve a good purpose lest anyone have too much of a moral inhibition to enjoy the movie. Whatever be the moral implications of the movie be, there is no denying that Rear Window is a suspense movie par excellence. The movie is about L.B Jefferies, professional photographer who has been confined to his apartment in a wheel chair after he broke his leg in the pursuit of taking an exclusive picture. As he has been confined in his apartment for six weeks he becomes progressively bored. To amuse himself he takes to watching the lives of his neighbors from the rear window of his apartment. There he is able to see them going about with their mundane lives. He also gives them some interesting nicknames. He calls a ballerina Miss Torso, a spinster Miss Lonely Hearts and so forth. His only visitors are his nurse Stella, and his girl friend Lisa Carol Fremont with whom he shares an uneasy relationship. He believes that Lisa maybe a bit too perfect for him. Lisa on the other hand loves him but even her patience is running out because of Jeffries’ moodiness from being cooped up within the apartment. However from being a passive onlooker of the events happening around him, Jefferies becomes more obsessive about their live and even becomes an active participant in it when he begins to suspect a neighbor (a traveling salesman) to have murdered his wife. Though nobody believes him at the beginning he eventually manages to convince Lisa of the crime. Together they try to find out if the murder actually occurred or whether it was all a figment of Jefferies’ imagination. Hitchcock shoots the entire movie from within Jefferies’ apartment. Most of the time, we are shown the same view that Jeffries has from the rear window. By doing so Hitchcock gives us a glimpse of all the happenings in the other apartments of the building. Through the open windows (due to the oppressive heat) we see the other bit characters of the movie go on with their live with varying emotions. Jefferies as well as we, see their anger, joy, sorrow and frustration. The most amazing part of it all is that not even once are they aware that someone is watching them and is paying close attention to them. Hitchcock creates a comic panel kind of feel when he shows different stories unfolding opposite to Jefferies’ apartment through the windows of the various characters’ apartment. Because of this he is able to show multiple stories and lives simultaneously. This creates a natural sense of identifying with the setting rather than being distant from it. Also by giving us the view from protagonist’s angle we are able to identify with the same feeling that Jefferies has. We sense his boredom, his anxiety and even his initial mild interest in the lives of his neighbors. Hitchcock shows his master class in keeping us hooked with such limited setting and keeps us engaged with some imaginative narrative. He is able to maintain, almost throughout the movie, the suspense of whether or not the salesman murdered his wife. By giving us a glimpse of an event which occurs when Jefferies’ is asleep he casts doubts in our mind as to the veracity of Jefferies’ claim. This helps in generating the right amount tension in us to find out the truth. The performances in this movie are all superlative to say the least. James Stewart is brilliant as the complex Jefferies, who go through a gamut of emotions. Due to his character’s lack of mobility Stewart has to convey the various feelings of Jeffries through his eyes, facial expressions and vocal variations rather than with body language. 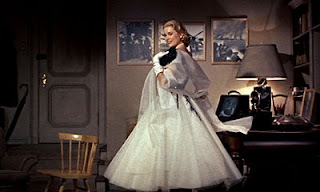 Grace Kelly as the perfect Lisa is indeed just that: Perfect. She brings an unknown something on to the screen every time she comes on it and lifts our hearts instantly. She adds that much needed glamour to an otherwise dreary setting of the movie. The snappy dialogues too make the movie immensely enjoyable to watch. Voyeurism is a topic that Hitchcock briefly touched upon in Psycho. 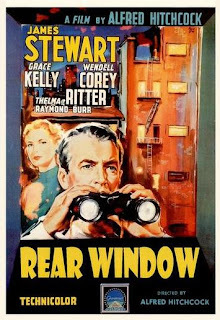 It has been showcased in many movies before and since Rear Window. But what Hitchcock has done here is to turn it more into a harmless pastime rather than something for sexual gratification or for other dark pleasures. He is not concerned with moral issues raised in the movie either. He is there to entertain us and to make a memorable suspense drama. And he is more than successful in that. thanks for your nice post, I will take a look around here. 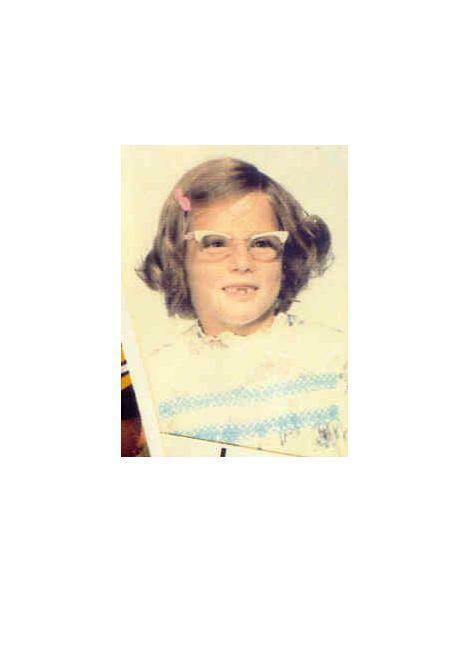 thanks - interesting blog over here, too. i'm sorry that it has taken me a bit to respond - been busy travelling. 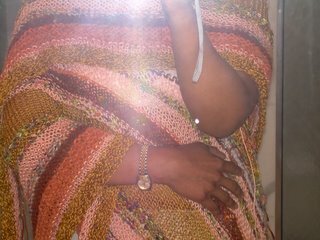 You have a very nice blog, I´ll be back soon again. Sorry but my english is not good enough. what is most stricking to me about this film is the color and the light. Visually I can't caught up in that whenever I see it. Glad you enjoyed it. I'll give your site a better look when I have more time. I'm currently on through my public library..only allowed an hour! 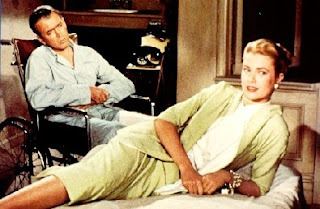 Rear Window really IS a masterpiece. A good coment on fear in closed places. Rear Window is arguably one of Hitchcock's finest. Thanks for stopping by. I'm glad you liked my blog, Biby Cletus. I am amazed someone in another country read my blog! I enjoy Alfred Hitchcock films, so now I must watch this Rear Window movie.